Maple and I have gone from being passionately, ordering-twice-a-day in love to more of a boring, happily married couple. 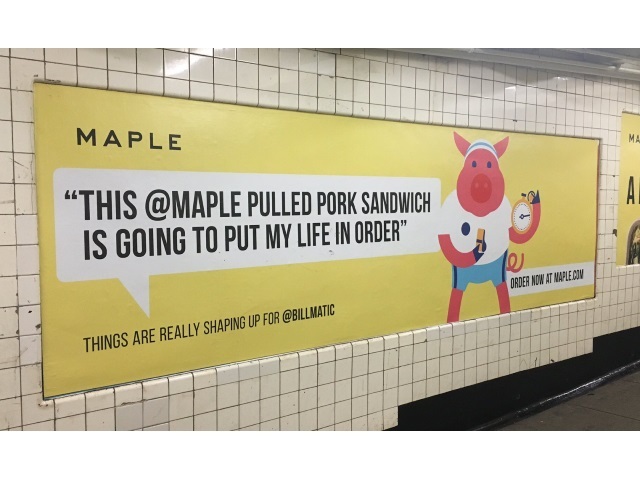 I normally don’t engage in public displays of affection, but right now, my affair with a food-delivery startup is on display all over New York and Twitter. That’s my tweet in the photo to the right. Let me explain: In October of last year, a startup called Maple began servicing a swath of New York that includes both my apartment and my office. Maple differs from other applications in that it doesn’t source its food from a variety of restaurants, nor is there a physical Maple location where you can get the same dishes available in the app. Maple is, essentially, a delivery-only restaurant. Maple and I have gone from being passionately, ordering-twice-a-day in love to more of a boring, happily married couple. We maintain a healthy, open dialogue about our relationship: I provide it thoughtful feedback when it has wronged me; it acknowledges that it heard me and promises to do better moving forward. It treats me like I’m the only customer in the world, and that keeps me coming back for more. Working in social strategy, I’m used to pursuing influencers on behalf of brands and organizations. Having now spent some time on the flip side of that relationship, I’ve learned a few lessons that anyone managing a community should take to heart. After every meal, Maple asks you to give their food a one-star to five-star rating, along with a comment explaining the grade–think Uber’s rating system. Asking for feedback is important, but showing that you’re actually paying attention is even more so. When your customers take the time to leave feedback, read it carefully. Train your employees to respond and ask for more details when appropriate or thank the customer for the feedback. Acknowledging the feedback keeps the digital comment card from feeling like a pointless exercise for the customer. Everybody likes to feel like they’ve been heard. Along those lines, make sure you’re doing something with all of that feedback you’re getting. Every single interaction between a consumer and a brand isn’t going to be perfect, so empower your customer-service representatives to make things right when something goes wrong. Even a gesture such as a modest discount on a future purchase can foster goodwill among the people who are buying and talking about your product. Brands are run by human beings, and human beings make mistakes. But when I trust that a brand is listening to my feedback and will make things right when I have a bad experience, it’s easy for me to recommend the service to my friends and colleagues. In 2016, customers are often pretty jaded about interactions with brands. Catch them off guard by surprising them with authentic and unique forms of engagement: a refund on a mediocre meal, a handwritten note or perhaps a little gift. With Maple, it started with a box of chocolates and a handwritten note, delivered to my apartment by a member of its customer experience team. Since then, it has sent me boxes of cookies, a small heart-shaped potted plant for Valentine’s Day and a framed illustration of my tweet, which they featured in its subway ad campaign. Similarly, Casper piqued my coworkers’ collective attention and spurred increased conversation by surprising me with a breakfast basket the morning after our holiday party because I had tweeted at it the day before. Whether they’re delivering treats to office buildings or providing value through social listening, brands such as Disney, Zappos, KLM, SoulCycle and Eleven Madison Park use surprise-and-delight activities to have fun, take risks and elevate the customer experience above and beyond normal expectations.